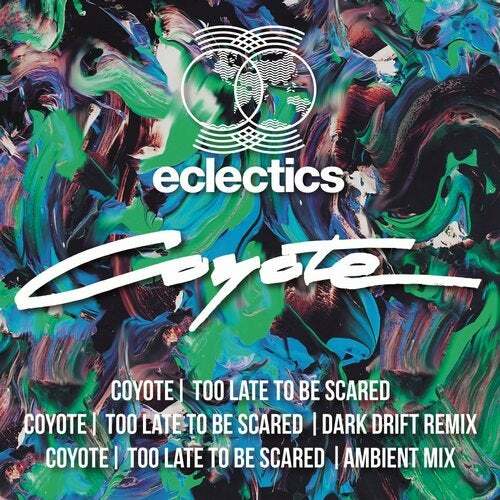 For the first release on eclectics' new digital label, the three mixes of Coyote's Too Late to be Scared cover a hell of a lot of ground - and at a variety of paces. First up, we have the louche, lolloping lilt of Coyote's original mix. As Christopher Walken's Poolhall Junkies cautionary tale of a lion forced to display his terrifying power drifts by, a slow, tribal beat marries with a slinking bassline, all hips and shivers. Meanwhile, the peals of percussion gently hint and insinuate, nudging the beat along while gentle acid lines float by, rising and falling with the synths, which hang suspended, camouflaged in the mix. It's full of potential and ready to pounce. Is it Balearic? Of course it is, it's Coyote after all, but that's only half the story. well, a third in fact. Taking a more muscular approach is the Dark Drift mix. The drums and shape-shifting bass are firmly fixed to the dancefloor as they build the foundations for a mid-paced, monster that transfixes and enthralls. "It's too late to be scared, it's time to kill," Walken reminds us, as the mix heads straight for the jugular with acid lines and punctuating synths that strip the original's flesh from the bones and rebuild it as a progressive house anthem. It's full-on guerilla tactics. The ambient mix, as one might expect, ditches the drums, holding back just the cymbals to explore the middle ground better. What we find is a dense undergrowth of tones, slowly shifting with slow purpose and intent. While the identity of the song has not changed, the character has shifted, "Every once in a while," Walken intones, "the lion has to show the jackals who he is." Well, quite. This is music for repose, perhaps, but not relaxing, it's simply too good for that.